The Arboretum Waterway is the location where all of the campus's recycled water is released. This highly nutritious environment is a perfect place for aquatic weeds to thrive. Contractors will soon begin to remove duckweed and other vegetation from the west end of the waterway (seen above) as well as Lake Spafford by Mrak Hall. Phase One of this project extends from the eastern terminus of the waterway and ends just west of the campus Redwood Grove. Bids for this part of the project were recently received by UC Davis Design and Construction Management who awarded the contract to a company that specializes in a wide range of infrastructure construction projects including the structural rehabilitation of marine wharves as well as underwater concrete and piling repairs — experience well-suited to this project. Look for Phase One construction to begin in February 2017. Visitors can expect to find detours around the construction zone from February through at least September 2017. What about the rest of the waterway? You may have noticed an unusual amount of plant life thriving in the highly nutritious water. 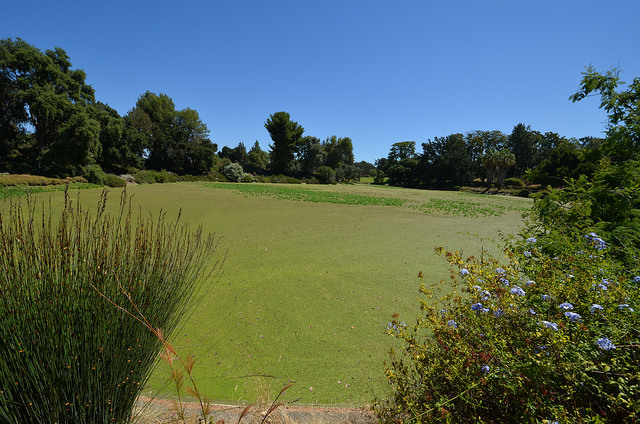 Because it will be a few more years before the rest of the waterway is enhanced, the UC Davis Arboretum and Public Garden is employing help from a local company that specializes in pond maintenance and aquatic plant removal. Visitors will see contractors removing large quantities of duckweed and azolla in the larger, open areas of the waterway at its far west end, as well as on Lake Spafford, as soon as the week of August 22, 2016. Project managers expect this work to last from ten days to two weeks. For more information about the Arboretum Waterway Maintenance and Enhancement Project visit our website here. *The start date for this project was postponed until February 2017 at the request of the awarded contractor.